The lingual nerve or gustatory branch of the fifth can be readily exposed in the mouth. On looking into the mouth, a fold can be seen going up and back just behind the last molar tooth. This is formed by the pterygomandibular ligament, running from the tip of the internal pterygoid plate to the posterior extremity of the mylohyoid ridge and joining the buccinator with the superior constridor muscles. An incision made just internal to this fold, below and behind the last molar tooth, will lead one down to the lingual nerve close to the bone. FlG. 146. 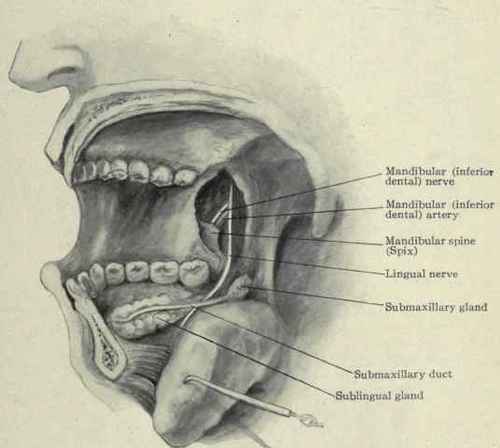 - View of mandibular and lingual nerves from within. The mandibular nerve is also reached through an incision running from the last upper to the last lower molar tooth. The finger is introduced and the spine of Spix felt at the inferior dental foramen. The nerve and artery enter the mandible at this point, the artery being below and posterior. The operation of Paravicini on this nerve through the mouth is unsatisfactory on account of the lack of proper exposure. 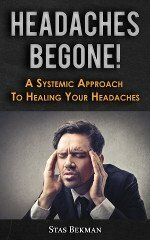 It is better to attack the nerve from the outside as detailed on page 60.